I recently stumbled upon Toggl, a tool that provides online time tracking and reporting, and thought I'd share it with those of you who need such an application and are not yet familiar with it. Toggl offers free, as well as paid plans, and you need to register to be able to use it. The free plan offers time tracking, timeline, autotracker, team management features (for up to 5 members), exporting reports as PDF or CSV, and much more. Check out the Toggl plans HERE. Furthermore, Toggl integrations with various services such as Wunderlist, GitHub, Trello, Google Docs, and many others. You can use Toggle directly from its website or by using its desktop applications for Linux (64bit only binaries; source code available), Windows and Mac, Firefox and Chrome addons, as well as mobile (Android and iOS) apps. 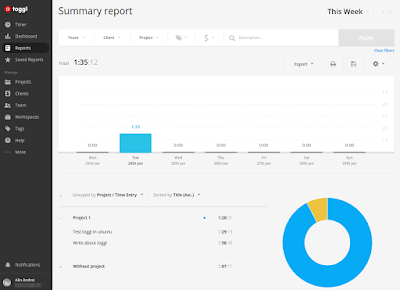 Both the time entries and active timers are synchronized using the Toggl cloud service across all applications as well as the Toggl website, which also offers various detailed reporting features. A few features are missing in the Linux desktop application, like an option to show the timer in the panel, adding new tags or editing tags (you can only select already existing tags), as well as the autotracker feature (this feature allows defining applications or keywords that trigger the tracker). 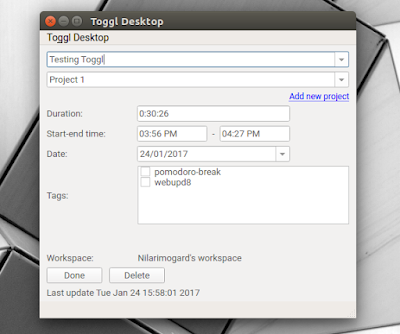 Despite of this, Toggl is a great tool, especially for those who work on multiple computers / operating systems, thanks to its synchronization feature. To get started with Toggl, create an account (you can also sign up with Google), download the application and log in. 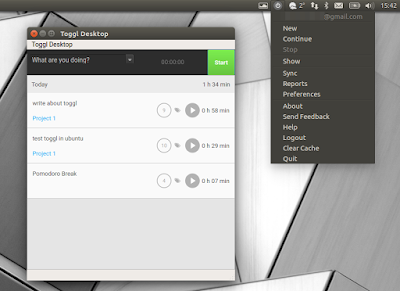 Note: for Linux, Toggl Desktop is available as a deb and generic tar.gz, both for 64bit only. If you want to use Toggl Desktop on 32bit, you'll have to built it from source. Also, pay attention to the Linux download page - on Ubuntu 16.04 and newer, you'll have to install gstreamer 0.10, which is no longer available in the Ubuntu repositories (exact instructions are provided for how to do this). 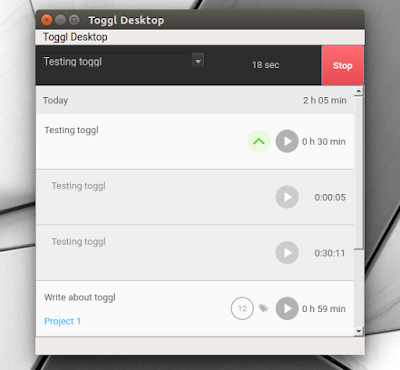 Arch Linux users can install Toggl Desktop via AUR: toggldesktop | toggldesktop-bin. I should also mention that the Toggl Desktop application for Linux lacks an option to start automatically on system startup. To get it to start with your computer (assuming you've installed it using the .deb package), open Startup Applications, click "Add", enter "Toggl" under name and "/opt/toggldesktop/TogglDesktop.sh" under "Command".